Tired of traffic jams and boring walks to and from work? Maybe college and school commutes are too crowded and stressful? If so, take a moment to consider the QIEWA – a fantastic electric scooter choice. With 800 watts powered motor and a 48-volt lithium battery, this scooter is meant for speed. It can drive up to 65 miles, and the maximum speed that you can achieve is 35mph. The big, chunky 10-inch pneumatic wheels are made to handle tough circumstances, and the double-disk brakes provide you with maximum security. The quick folding mechanism will also save you time when traveling, as will the quick unfolding system.. The QIEWA has an 800-watt motor that is coupled with a 26Ah-48V 5C lithium battery. This combination is the ideal match of power, speed, and safety. 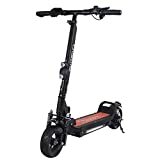 If you have found that other scooters are too slow and sluggish, purchasing the QIEWA will be a step in the right direction. It can transport you where you need to go at surprisingly high speeds, ensuring that you will always be on time for your appointments. The motor is located at the gear, keeping it away and safe from damage that can usually be inflicted by curbs and small rocks. This is one of the main scooters used for transport in big, metropolitan cities where time matters, as well as efficiency and arriving quickly. While most scooters can only handle small uphills, the QIEWA motor has been made to defeat all obstacles in your way. It can ride up very steep inclines without fail and handles hills flawlessly. If you have a tricky road to work or school, this scooter will overtake all obstacles, traffic jams, hills and pedestrians without any trouble. Due to the overwhelming speed, this scooter can race at, it’s mostly recommended to be ridden by older kids, teenagers, and adults will enjoy these electric scooters. From the get-go, it’s visible that the QIEWA is a bit more heavy-looking than other scooters. Most customers, however, don’t seem to mind this slight inconvenience, since the hefty build is the reason as to why it performs so splendidly well. Without it, the scooter wouldn’t be as strong, and wouldn’t be able to handle as much daily wear and tear as it can. Reviews support the fact that the extra lbs support the fantastic performance of the QIEWA. That’s why we encourage customers to not be potentially alarmed when first feeling the robust build of the scooter during the unpacking-phase. The frame itself is thick and sturdy, ready to help support you on your journeys. It’s stable and made from quality material that ensures it won’t snap or break no matter what you throw at it. Due to the high speeds that this scooter can handle, it’s natural for the company to also equip it with a set of reliable and responsive double disk brakes. Shock absorbers will help reduce any jolts and vibrations that may come as a result of riding on uneven pavements or cobblestones. The brakes are located both at the front and the back for maximum protection when cruising. When operated, the brake responds immediately and within a second you will be able to lower your quick cruise and reach a comfortable speed. This is ideal for those times when you are among crowds, or when you see unforeseen obstacles or circumstances arise in front of you. To keep the sensitive brakes at their top performance rates, many customers who already invested recommend adjusting both rear and front brakes every so often. This is usually a natural upkeep tip for all scooters, but due to the heavy-duty nature of the QIEWA, it’s important to be mentioned. With big, chunky, pneumatic 10-inch tires, the QIEWA Hummer has one of the strongest wheels available on the scooter market. They are definitely a big part of why it performs so well, and they make sure to support the constant, reliable performance. You will be able to roll around rough terrains, hills uneven pavements, gravel roads, cobblestones and much more. No matter where you are, the Hummer will still allow you to get where you need to go. Potholes and road bumps will be completely absorbed by these pneumatic tires to provide you with a comfy, safe, easy-going ride. The endurance of these tires is certainly commendable, and they don’t fail to disappoint. Time and time again they have proven their worth during uphill rides. The friction is ideal, and there is no need to worry about sliding back down. The Hummer is considered to be one of the quickest scooters on the market. It can cruise at more than 35mph, and even faster if you are going downhill or are a lightweight rider. This speed can mean that more safety precautions need to be taken, especially since the scooter can whizz past bumps and cracks, too. It can be very easy to stop paying attention and run into someone or cause an accident. At 35mph, you’ll get to journey at least 65 miles per charge. If you feel a need for speed during your commutes, the QIEWA will handle all of that splendidly. You will be able to enjoy an entertaining, fast ride without standing around and waiting. The necessity of boring commute walks will also be eliminated! The QIEWA Hummer sports a 26Ah 48V 5C lithium battery, which allows for great efficiency when we look at the everyday usage of the QIEWA. You can easily ride to and from work twice and still have some charge left within the scooter, and many customers report this happening. You also get a battery charge display situated on the top side of the handlebars. Here you will be able to see exactly how much time you have left before the scooter wheezes out of energy. Even if you do end up running out of charge mid-way, the scooter is designed to also support manual, traditional, kick & scoot rides! With the 48V battery, you won’t have to charge the scooter any longer than 3.5 hrs to reach the 100% full battery capacity. Even if you find that you don’t have much time to charge, 2 hrs of charging can give you a battery that is already 75% charged. The QIEWA is definitely built on efficiency, and that’s why it’s such a reliable ride all-around. No matter what the circumstances, the QIEWA Hummer seems to be able to handle it all without any shortcomings. The QIEWA is simply packed with dozens of small features that help make the ride more enjoyable for everyone. The Hummer can handle up to 550 lbs (something that cannot be said for any other scooter on the market), a 100% waterproof certification from IP65 and a USB mobile charging feature. If you ever find that you run out of your home with your phone clinging to life at 2%, you can easily plug it up to the scooter and allow for a quick boost charge. This is a fantastic feature that will surely prove useful to many. Especially since nowadays phones need to be relied on dearly for work and everyday communication outside the home. The dimensions of the QIEWA equal to about 44.5 x 9.8 x 47.6 inches, it can carry riders that don’t exceed 550lbs (a statement no other brand can claim) and is 100% portable and durable during tough rides. Weight and build of any rider shouldn’t pose any sort of problem when regularly using the QIEWA Hummer. The QIEWA Hummer is the perfect scooter for avid commuters. If you have a long way to work, school or need to run everyday errands, then the Hummer can be a true helping hand. Teenagers from 15 years of age and above, as well as adults and seniors, can safely ride this scooter. The QIEWA is however not recommended to be used by younger kids (below 12) due to its fast accelerating speeds. One thing is sure: no matter who you are, where you work or how bumpy and uphill your way to work or school is, the QIEWA will get you where you need to know. The QIEWA has a special place in our hearts thanks to its durability. Yes, the weight of the scooter itself may also be slightly increased because of this, but the performance out-rules all of the cons the Hummer could have. 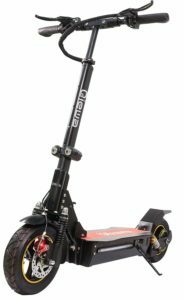 The pneumatic 10” wheels, along with the sturdy thick frame and reliable deck help this scooter be one of the top competitors in its niche. It’s hard to see any cons within this scooter, and that’s why investing has become a must for most hesitating customers!